Our staff is dedicated to meeting the unique needs of every feline patient. We offer a wide range of services, including, but not limited to, Wellness and Preventative Medicine, Emergency Medicine and Surgery, Dentistry, Parasite Prevention, Radiology, Pain Management, Cardiology, Pharmacy, Euthanasia and Hospice Care, and much more. 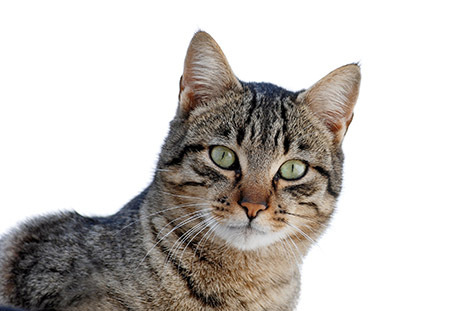 Leave your cat in our comfortable, air conditioned boarding facility to be cared for by our trained technicians. We have kitty condos and a playroom available. Our playroom is equipped with the Petcube which allows you to view, play and talk to your cat via an iPhone or Android app. 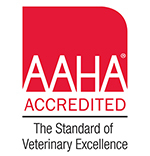 We are a local, family owned business with an amazing team of doctors and veterinary technicians. Our team has over 35 years combined medical experience in serving cats. Our owners live in Media and you may see them walking or biking to work. We continue to exist because of our loyal customers who have been referring us to new patients for many years. Helping and serving our community is what we do. 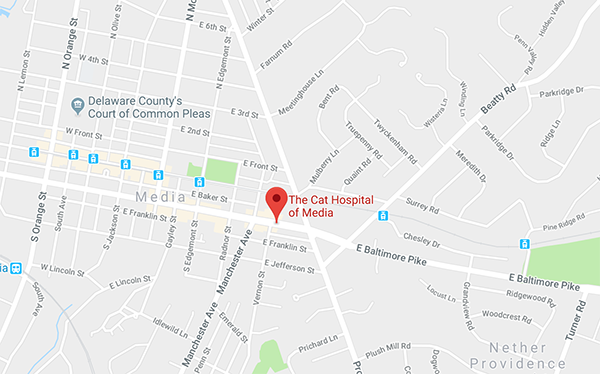 Our veterinary hospital and boarding facility is located just minutes from the Blue Route in downtown Media. There is parking in the rear. From Baltimore Ave. turn on Vernon Street. You will see a small Alley on your left called Worrall Street. Turn into Worrall Street and our lot is on your left. Look for the cat murals painted on the back of the building! Payment We accept all major credit cards, checks, cash and Care Credit. We work with all pet insurance plans. Payment is expected at the time services are rendered. At our clinic, we often get questions regarding pricing for anesthetic procedures. Specifically, most owners want to know why we charge more than some area non-profit organizations. Besides being a privately-owned small business that cannot fund-raise to offset costs, we practice a high-level standard of care when it comes to anesthetizing your cat. It is possible that a less expensive facility may do everything that we do, but the important thing is to ask. 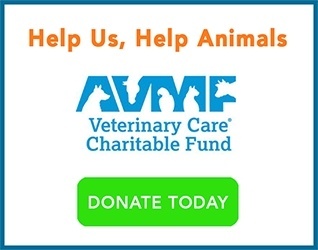 The Cat Hospital of Media has enrolled in the AVMF Veterinary Care Charitable Fund, a program created by the American Veterinary Medical Foundation (AVMF) to support veterinarians in offering low or no-cost services to clients facing extraordinary hardships, as well as a way to support animals rescued from abuse and neglect. We donate considerable time and money each year to local, animal health-related charitable endeavors in and around Media, Pa. As a participant in the AVMF Veterinary Care Charitable Fund, we will be empowered to provide charitable care to those in need, including: low income senior citizens, Good Samaritans who rescue domesticated animals, and assistance for persons affected by unforeseen financial hardship.